It is fair to say I’m a huge fan of speech recognition software especially when it works. The sheer amount of time and effort that can be saved with a decent bit of voice recognition kit is unbelievable. 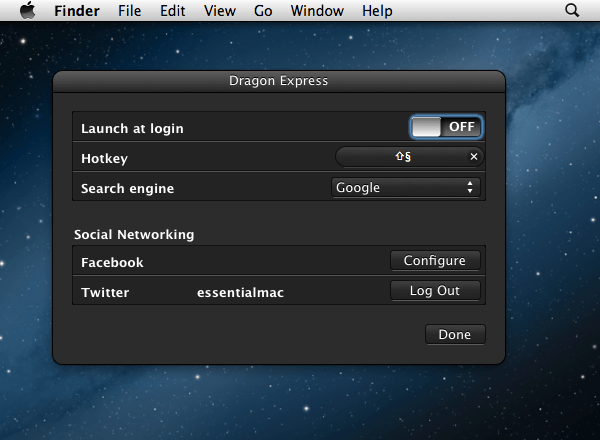 As a fan of Dragon Dictate for the Mac platform I’ve been waiting for ages to get my chance to review Dragon Express and finally that day has come. Setup is the standard affair of selecting your microphone and then performing some basic voice recognition training. By default the internal microphone is selected but it becomes clear (pardon the pun) very quickly that you really need to invest in a decent microphone, more on that further on. On the subject of training every time you add a new audio device as a microphone you have to repeat the training. In less than 5 minutes training is complete and that’s basically that. 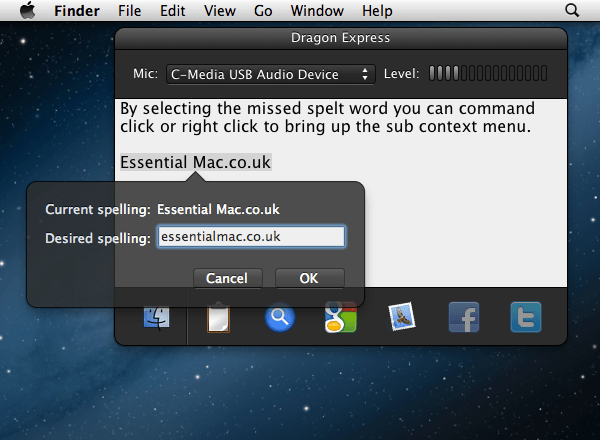 This is practically nothing when compared to Dragon Dictate for Mac and the results after the 5 minutes? Quite simply, amazing! Even with my somewhat strange accent it very rarely missed a beat and the number of misspelled or wrongly recognised words was minimal. As mentioned earlier dictation takes place in completely separate window to that of any application running. The icons at the bottom are pretty much self explanatory acting as speed short cuts to some of the more common every day tasks. The left most icon at the bottom of the display is the most recently used application you were using before you invoked Dragon express. 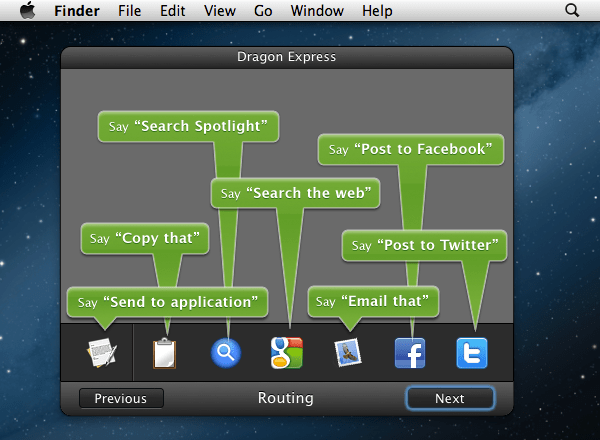 Saying “send to application” sends what’s in your window to the cursor point of that application and this is where one of the many frustrations of using Dragon Express starts to rear its head. If I say “send to application” and the cursor is in the wrong place or in a new application that doesn’t accept text it will still try to copy and paste the dictated text. However once text is sent and removed from speech window there is no way to recover it. Basically mistakes using this program are extremely costly. Once you lose what’s in the speech window it’s gone forever into the midsts of time. Forget any chance of an UNDO or step backward. As seems the case with all of Nuance’s mobile dictation products they really don’t care if you loose your text. 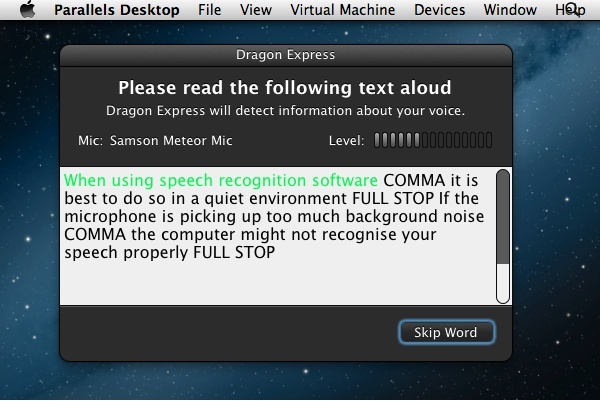 As Dragon Express operates as a stand alone program from which you transfer into other programs, one of the first things you going to want to do, other than investing in a decent microphone, is set at the shortcut key because believe me you’re going to be using that key hell of a lot. Without the short cut key, any time the program loses focus it simply disappears. There is nothing to indicate it’s presently running as there is no dock icon only the menu icon in the top bar. 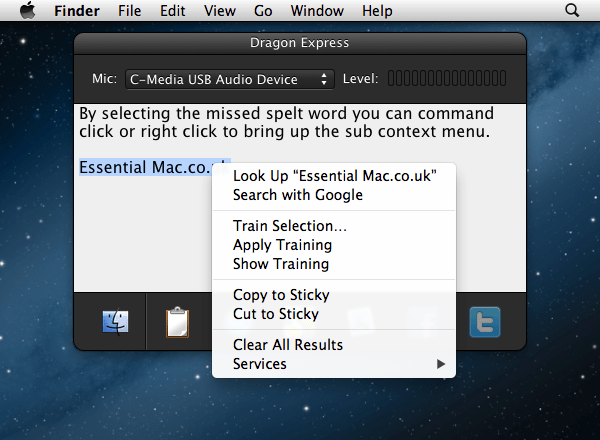 So you’re left with either clicking the Dragon icon in the menu bar then clicking Dictate to bring the dictation window back to the foreground or pressing the short cut key. Setting up the shortcut key proved to be problematic in itself. In most programs pressing a combination of keys and then pressing the return key means use that that combination of keys. Dragon Express however thinks the return key is part of the short cut and I found the only way to register a new short cut was to type it in and close the set-up window. Performance quite simply put is blisteringly fast. I regularly use Dragon Dictate for Mac and things seem to reduce to a crawl more that I would care to mention and this is running with 8gb on my Macbook Pro 2009. The sluggish copy and paste as found in Dragon Dictate is never a problem unless you are posting into a website using flash (aka wordpress). I would go so far as to say that the speech recognition time is almost double that of its bigger brother. Accuracy wise there’s nothing to complain about either. At the risk of sounding just a little bit repetitive the accuracy rate is quite simply stunning given the amount of training you have to do. 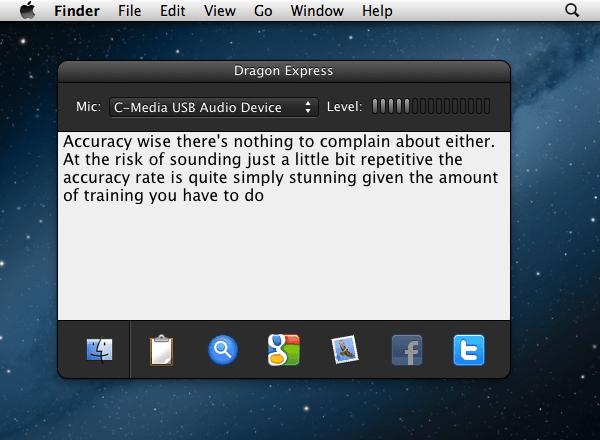 I’d almost say that after several hours of use, dictation error rates are even less than that of Dragon Dictate. This whole review was written using Dragon Express with only minimal editing and that brings us nicely onto the subject of microphones. One thing that I noticed when using the internal microphone is that I felt I really have to slow down the pace and certainly pronounce words with more emphasis than I did with my Plantronics headsets that came with Dragon Dictate. Even with taking the extra time to speak clearly and concisely this was still way faster than my typing skills. Things work better when you have no background noise and learn how to position yourself in front of a microphone. So far so good then you might think Dragon Express isn’t without its multitude of annoying problems which rear their head and chip away at the sheen of the product, spoiling what could be a flawless and smooth experience. It’s completely unacceptable that when text is removed from the Dictate window there is no chance of getting it back. Even the CMD + Z (The universal shortcut for undo) does nothing. Yes I mentioned this earlier but did they really not learn from Dragon Dictate mobile, an application I stopped using because of this. Some of the other problems I’ve encountered. Why does the clipboard icon say copy when it actually cuts the text from the dictation window? See the above point on how easy it is to lose what you just said. There is a worrying lack of support from the makers of Dragon Express. Lack of clear documentation on how to flush out any mistakenly ruled learned rules or words. Sometimes when you copy and paste from the dictation window it likes to change the font and size of the text, so at times you how to use the “pace and match style” option.. Even with all the negatives and some of them are close to being show stoppers I actually really like the program and further makes me wish for a more complete speech recognition system where some thought has gone to the actual users. The main selling point for me is the raw speed of processing and with error rates have been as minimal as I’ve ever seen in software like this, edits are really down to a minimum. I did my testing on what could be classed now as an ageing MacBook Pro from 2009 and there was no noticable slowdown or impact on other running applications. It’s a testament to the program that even with all these issues I still find it easy to recommend and when used with a half decent microphone then I would recommend the even more so. The pricing does mean that is not a throwaway program but for charging a premium of £34.99 I’d still expect a bit more spit and polish for this level of financial commitment. But still if you find yourself at a keyboard for a great period of time this certainly will help improve your work-rate. For reference I used the Plantronics 955h headset which is a cracking, comfortable little unit but unfortunately is wired. A quick update for everyone. During my time of testing I noticed that random text was being placed into other applications on my virtual machine. Now, I thought this was just pure coincidence because I’d been having a few problems with my machine of late. Yet when 1000 emails got marked for deletion something made me sit up and investigate this. It turns out that Dragon Express, when you use the send to application feature, can sometimes paste into other applications other than the one in focus. In short use the copy command and don’t risk using the send to application instruction! Like I said, I thought this was just me, but reading the forums it seems that this can happen to anyone. In the typical Nuance way they just cite Bug fixes for this update. Would be nice if they said what bugs…. Next Next post: Old and new iPad screens compared through olloclip.